Schoolchildren would have to pick up more whole grains, fruits and vegetables on the lunch line under proposed new federal standards for school lunches. WASHINGTON – Schoolchildren would have to hold the fries – and pick up more whole grains, fruits and vegetables – on the lunch line under proposed new federal standards for school lunches. The Agriculture Department proposal announced Thursday applies to lunches subsidized by the federal government and would be the first major nutritional overhaul of school meals in 15 years. The guidelines would require schools to cut sodium in those meals by more than half, use only whole grains and serve low-fat milk. They also would limit kids to only one cup of starchy vegetables a week, so schools couldn’t offer french fries every day. 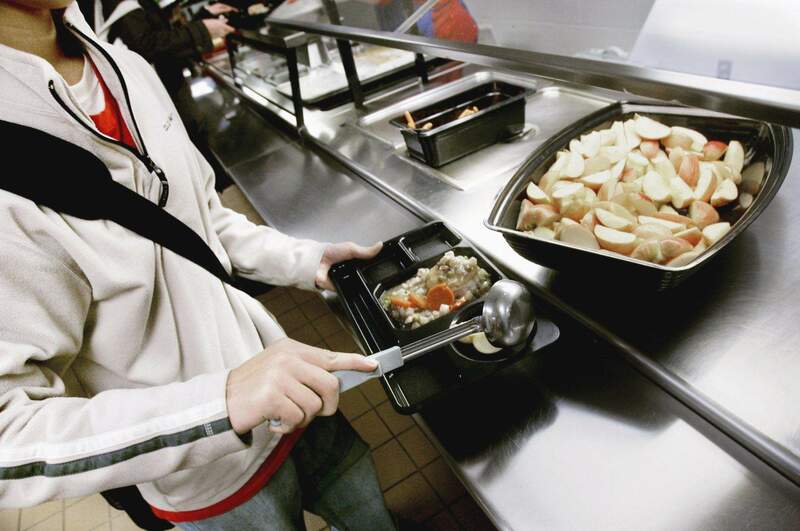 Agriculture Secretary Tom Vilsack said the new standards could affect more than 32 million children and are crucial because kids can consume as much as half of their daily calories in school. “If we don’t contain obesity in this country, it’s going to eat us alive in terms of health-care costs,” Vilsack said Wednesday before the release of the guidelines. While many schools are improving meals already, others are serving children meals high in fat, salt and calories. The new guidelines are based on 2009 recommendations by the Institute of Medicine, the health arm of the National Academy of Sciences. The announcement comes just a few weeks after President Barack Obama signed into law a child nutrition bill that will help schools pay for the healthier foods, which often are more expensive. That new law also will extend similar nutrition standards to foods sold in schools that aren’t subsidized by the federal government, including “a la carte” foods on the lunch line and snacks in vending machines. The announcement is a proposal, and it could be several years before the USDA issues a final ruling on the standards and schools are required to make changes. b Establish the first calorie limits in school meals. b Gradually reduce the amount of sodium in the meals over 10 years, with the eventual goal of reducing sodium by more than half. b Ban most trans fats. b Require more servings of fruits and vegetables. b Require all milk served to be low fat or nonfat, and require all flavored milks to be nonfat. bIncrementally increase the amount of whole grains required, eventually requiring all grains to be whole grains. b Improve school breakfasts by requiring schools to serve a grain and a protein, instead of one or the other. Some school groups have criticized efforts to make meals healthier, saying it will be hard for already-stretched schools to pay for the new requirements. Some conservatives, including former Alaska Gov. Sarah Palin, have charged that telling children what to eat is a case of government overreach. Vilsack says he understands the new standards may pose some challenges for school districts but they are necessary. He compares obesity and related diseases like diabetes to a truck barreling toward a child, and says the new guidelines are like a parent teaching a child to look both ways before they cross the street. “You want your kid to be able to walk across the street without getting hit,” he says.